A few passing clouds, otherwise generally clear. Low 34F. Winds light and variable..
A few passing clouds, otherwise generally clear. Low 34F. Winds light and variable. KANSAS CITY, Missouri — As 2018 comes to a close and the window for correcting paycheck withholding errors narrows, an H&R Block survey shows why so many failed to update their withholding: they don’t know how. Only 46 percent of respondents said they felt prepared to update their W-4 on their own and many showed confusion over what information a W-4 uses, when and where to submit a W-4, and how allowances iåncrease or decrease withholding. Consumers can get help updating their W-4 before the end of the year by visiting an H&R Block office for a free tax reform checkup, which includes W-4 planning, or early next year when they file their taxes with H&R Block. 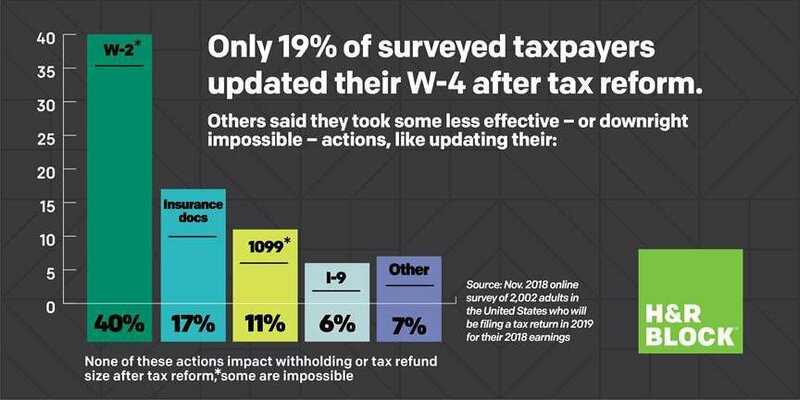 Failing to update their W-4 puts taxpayers at risk of unplanned outcomes, ranging from higher refunds that could have been helpful during the year, to owing the IRS instead of getting an expected refund. If taxpayers don’t like their outcomes this tax season, going forward, they can update their W-4 with their employers to ensure they get a more desirable outcome next year. Before even getting into the details that go on the W-4 form, respondents were already confused. Only 42 percent of respondents knew they should submit their updated W-4 to their employer. Of respondents, 27 percent thought it went to the IRS, 7 percent to their financial advisor, or 6 percent to the Social Security Administration. Respondents also did not feel confident they could update their withholding on their own. Only 46 percent felt prepared to update their W-4 while 31 percent did not have anyone they trusted to help them. Schedule a tax reform checkup online, or by calling 800-HRBLOCK.